Here I am with another update on my weight loss. After last week's loss, I must admit I was super excited and very motivated to get on with it again this week. In my head I'm just trying to focus on a week to week basis as I have many pounds to lose. I saw on "Obese A Year To Save My Life" which is my new motivational program to watch that if you cut out sugar for seven days you no longer crave it. I do believe at this point that I had virtually cracked it and literally never felt any sort of craving which is half of the battle with me. I definitely do feel a lot different in my posture and the area around my waist I'm convinced is few inches smaller. This is evident in a jacket that I absolutely adore. Unfortunately I only bought it within the last two months after searching for something like it for such a long time. As it was reduced in price when I bought it, the only size that was available that would fit at that time was the size above what I actually was however I had the button moved so that it still fits me nicely. Now I know this sounds crazy but I love this jacket that much that I have returned back to ASOS site where I bought it from and the only size left was one that is a couple below what I am now so what I've done is I've bought it as my motivation to fit into it. Every now and again 'm going to drag it out as a reminder that I am getting closer to my goals. Since I have a true sweet tooth, the one thing that I've been trying to do since finding out that it takes seven days to get the addiction of sugar out of your system is to avoid the sweet treats. Of course this is only good temporarily because the reality is that I will need to have occasional treats so that I don't end or bingeing on them at some other point. 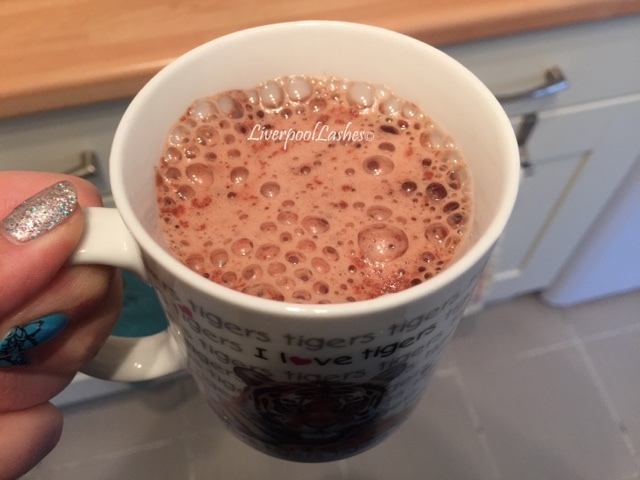 The one thing that I tried this week was the Wispa Gold hot chocolate. It said it had bubbles in it which I thought was laughable because obviously if you mix hot chocolate it would make bubbles but this is quite unique. The moment you put water in it all of a sudden these bubbles that you can see in the photo appear. The surface where all the bubbles were was really nice but have to admit that for five syns as per the Slimming World plan, I wouldn't say that that was tasty enough to have again. 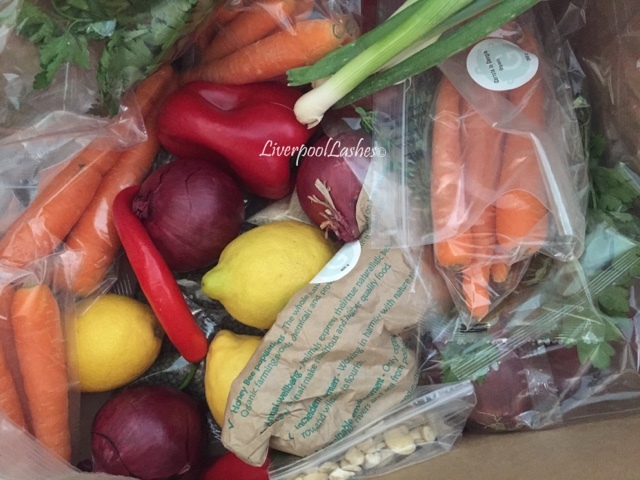 I got my Gousto delivery this week which I must admit looked brilliant in the box because of all the colourful vegetables in there. 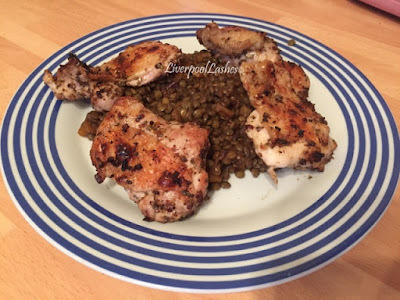 So far, as it only arrived on Friday, we have cooked a few of the meals and I've discovered that I definitely don't like lentils however I am pleased that I tried them. 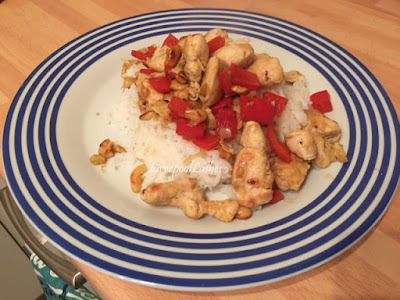 I'm hopefully going to get a little bit more adventurous and if I keep trying new things, I do think that it saves you being bored of the same food over and over again. 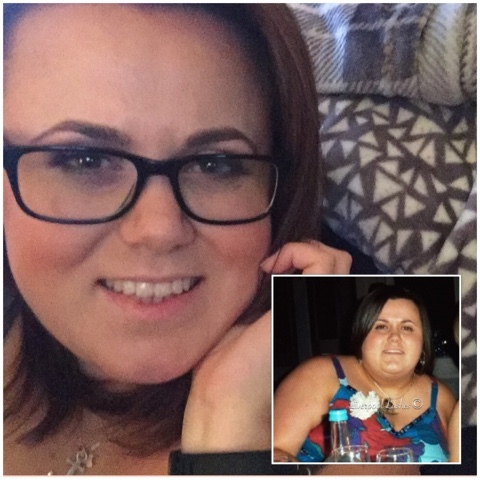 What's been lovely is Alex, somebody that followed my Facebook page, left a comment under one of my posts a couple of weeks ago to say that she had lost over 8 stone which was amazing and she's gone on to support me via private message. I do think that the support is key, it's such a long process that sometimes there will be stages that you just need a little bit of cheering on and since Alex has being there, she is the one of the best people to speak to. I'm still loving the MyFitnessPal app, if you're not already friends on there then please do come send me a request I'm just 'liverpoollashes' on it. I have actually ordered a Fitbit which I'm hoping to get soon so that I can be more motivated and do a little bit more exercise. To be honest, I don't do very much since I work from home so it can be a little bit more difficult, I'm not really doing the steps that other people are doing or being as active at all. For that reason I definitely need to make more of an effort and of course it will be is my metabolism. Typically like the child that I am, I only ordered it yesterday and I really want to get it straight away but I will have to wait! So onto the thing that is the most important, the weigh in. I'm not even going to lie I have actually been hopping on and off the scales all week, it's so difficult because you just get curious but I do know it's naughty to do that! For whatever reason I just had a feeling that I hadn't lost very much because the scales weren't really moving so I braced myself and hope for the best. The results are that I lost 2 pounds this week, bringing me to a total of 11 pounds in three weeks. I am trying to be pleased, I know many say that you need to focus on that I've lost 11 pounds in such a short space of time but it's hard to do that when you think that you should have really lost maybe three or four, particularly with the amount of effort I put in for it. I am trying to tell myself that if I carry on going then hopefully next week will be a bigger loss. At this point though I get a little anxious when I've lost less than what I think I deserve because it's then easy to slip back into old habits and just be like "oh well I'll just eat anything I want." Trying to look at the bigger picture I am definitely a lot happier with the 11 pounds gone and hopefully next week I will be able to say that to you that I've lost a stone. Until then - onwards and downwards! I actually plan to post this and get on my treadmill!